My relationship with Pete Skjold began years ago and has culminated in the relationship with a luthier that I had always dreamed of. Pete can build me the instrument that I want while giving me the sound that I want. I can't say enough about Pete but, to see the result of this relationship, check out the "Damian Erskine Signature Whaleback" or the "Catacomb" models. Everything GruvGear designs and builds is that "thing" that forces you to appreciate the attention to detail and level of craftsmanship. I have been using their V-Cart for years and it is still going strong. I am also lucky enough to have a direct relationship with them with regard to the "DuoStrap Signature" and "DuoStrap Neo", which I helped to design (fine tuning the original version which I had built for myself over a decade ago and turning it into a revolutionary way to relieve pressure on your neck and back when wearing your instrument). I have been using Aguilar Amplification for over a decade and I still get excited when I hear my bass through them as compared to other rigs. They are the best all-around cabs and heads on the market, in my opinion. I love those things! D'Addario Nickel strings have been my "go to" strings for years. You just can't beat em'! 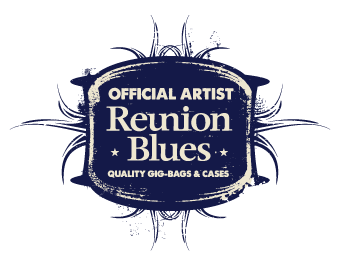 When it comes to gig bags, I've tried them all and I always come back to Reunion Blues (my first gig bag was a Reunion Blues, when I was 6 years old!). Built like a tank, sized fantastically for air travel and very protective of your instrument. I love my gig bags! Pig Hog’s “Armor Clad” series of cables are just that. Overbuilt, Bullet-proof, slick looking, and great sounding. These cables are actually cased in a conduit style, metal sleeve which means NO TANGLING and these things are built tough. Has to be seen and heard to be believed. The ultimate in road worthy. MXR has been leading the charge with their fantastic pedals. I have found personal nirvana with the Octave Pedal, in particular. It finally overtook the seemingly unbeatable OC-2 in my eyes. It does everything the OC-2 did so well and more. I have yet to try an MXR pedal that didn't leave me wanting to rewire my pedal board to incorporate it. I use the Torpedo C.A.B in my touring rig with Gino Vannelli and have used it on quite a few recording sessions. It is the best simulator of it's kind and blows everything else out of the water. Everything they build is cutting edge and made for musicians by musicians. It just works. I can't say enough about this do-it-all (and do it better than anyone else) little box. The BassWitch IQ-DI has 2 effects loops, A/B box, boost, super clean DI and a fantastically clean and well voiced EQ. This little thing changed my life. I bring it to every session and use it on most any gig that's worthy of it. Hands down. My first choice in the studio. Best DI box out there, in my opinion.